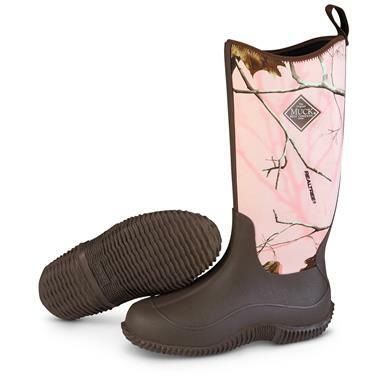 Waterproof boots keep your feet dry and stylish. When it's time to get dirty, it's time to get Muck Boots. The best hunting grounds sometimes have the worst conditions... muddy, mucky, cold, wet, basically miserable. But thankfully, these Boots from The Original Muck Boot Company were built to handle the toughest wetlands. Track through swamp, mud, slush and snow, and stay warm, dry and comfortable. These Boots are at home on the hunt, but they're also great at home, too. Their 3-season comfort rating makes them great for hunting in the fall and winter, and working in the yard in the spring.